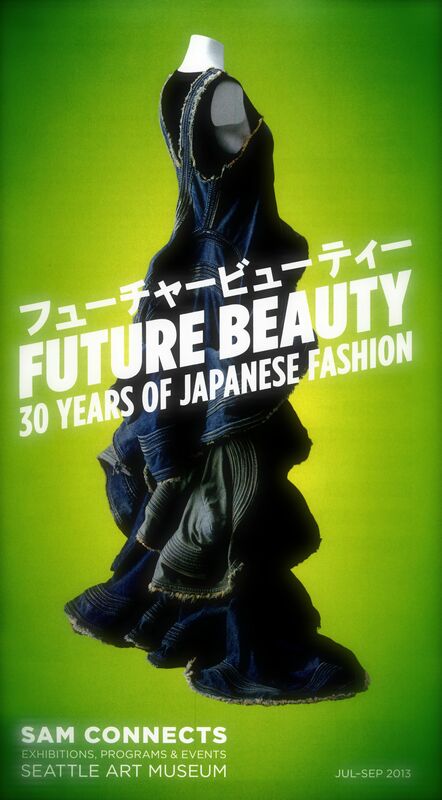 Future Beauty: 30 Years Of Japanese Fashion…ends today in Seattle. Future Beauty: 30 Years Of Japanese Fashion ends its nearly two month run today at the Seattle Art Museum on September 8th. I was lucky to enough to catch it and if you’re in Seattle so can you. If you’re interested in Japan or Fashion or—Japanese Fashion—it’s worth making a pilgrimage. Featuring the works of fashion luminaries like Issey Miyake, Rei Kawakubo, and Yohji Yamamoto—it’s a monumental history of Japanese fashion and a neat look at changing modes in Japan culture. Personally, I’ve always felt that fashion was just an impediment to figuring out whether the object of your desire would look good naked, but then I’m a barbarian. Thank heavens the exhibit has an activity book for small children which explained fashion to me, and Japanese fashion, in a way I could understand. Our resident fashion historian and culture writer, Kaori Shoji also explains what it all means in her accompanying essay to the exhibit, What We Think About When We Think About Clothes. However, unlike the activity book, her essay is definitely not meant for small children. However, for the little tykes, here’s one way of explaining what it’s all about. What does what you wear say about you? Did you know that fashion is wearable art? Great fashion, like great art, requires creativity and skill. All of the fashion that you see in the exhibition is from Japan*. The men and woman who designed these garments were considered pioneers because they looked at style and fashion in new ways.—Future Beauty: 30 Years of Japanese Fashion SAMkids Activity Guide. If you do make it to the exhibit, don’t leave with doing the activity book. It makes the show ten times more interesting. The innovation and sometimes lumpy monstrosities (one opinion) of Japanese fashion designers who revolutionized world fashion is the focus of this special exhibition. On display are nearly 100 items, ranging from chic and wearable to outrageous and puzzling—it’s worth walking through slowly, reading the placards, and soaking it all up, if you have the time. The Seattle Art Museum, on their website, explains it better than I ever could. 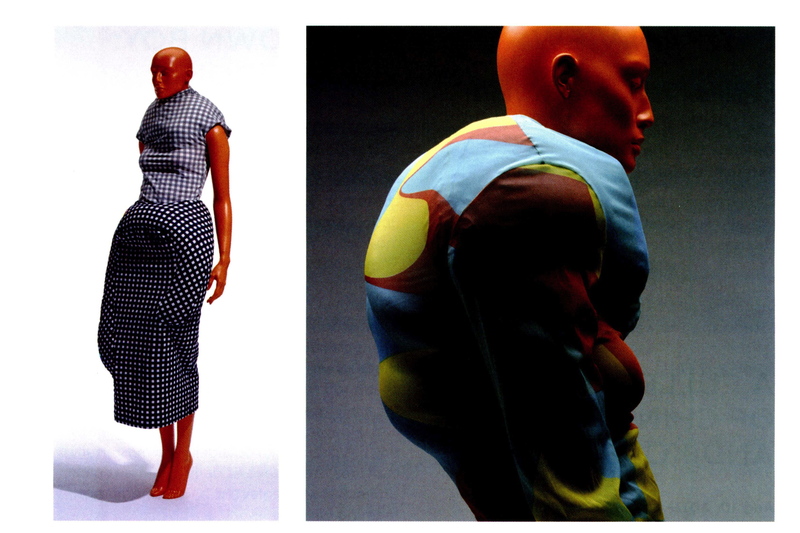 “In the 1970s Japanese designers Kenzo Takada and Issey Miyake had already gained recognition in the West, but it is in the 1980s that Japanese designers emerged with an entirely new aesthetic. In the summer of 1983, Rei Kawakubo and Yohji Yamamoto brought forth a stark new aesthetic at the Paris runway shows. Based on monochrome black and white, they presented asymmetric and at times perforated dresses, which loosely described the female silhouette. These designs were recognized as a radical counterproposal to Western notions of the fitted form and gained instant notoriety. This was an explosive new beginning of what is now three decades of innovative design that has in turn influenced and reshaped our Western aesthetics of dress. Curated by Akiko Fukai, director of the Kyoto Fashion Institute, the exhibition showcases the early emphasis on light and shadow, and the increasingly diverse, innovative designs that range from the deconstruction and reinvention of Western couture models to brightly colored designs that are inspired by contemporary street fashion. As the barbarian in the room, particularly mesmerizing were the works of one designer, where the models faces are made up as to match with patterns of their clothes. One can’t help but think plaid tattoos may never really catch on. For those of you who can’t make the event, the lavishly illustrated catalog and book created for the exhibition is a fantastic reference source. *The garments were actually probably really made in Japan, during the day. Now we would assume that half of them are made in China or Korea. So it goes. 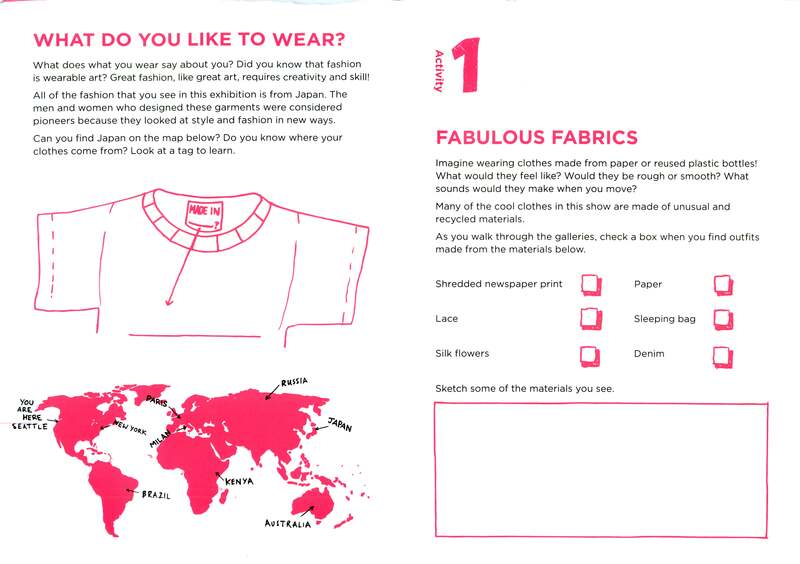 Japanese fashion—made in China.